We do our best to make good choices for our family when it comes to places we’ll travel, accommodations and activities. Many times, we nail it. And sometimes we fall for inflated reviews and get caught by our own poorly set expectations. 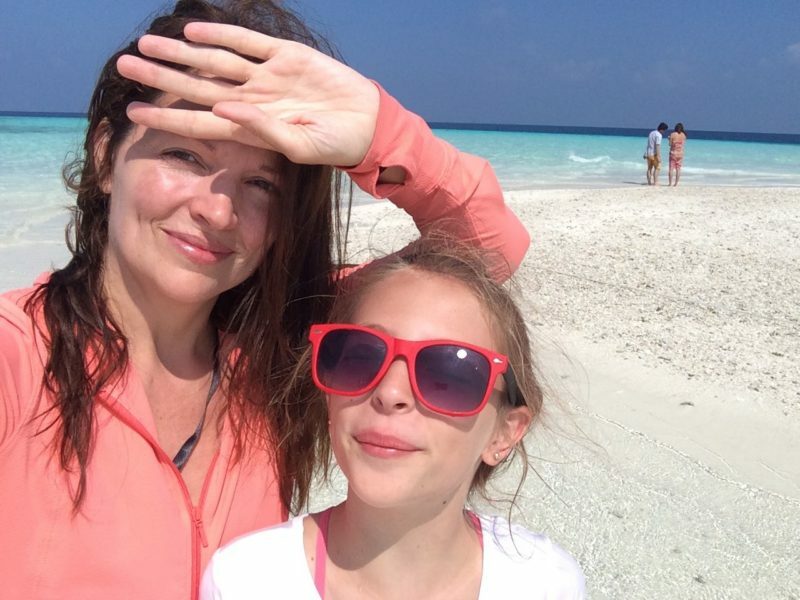 So, I wanted to list a few of our winning tips of what worked and what didn’t work for our family in the Maldives. This one could’ve gone either way. 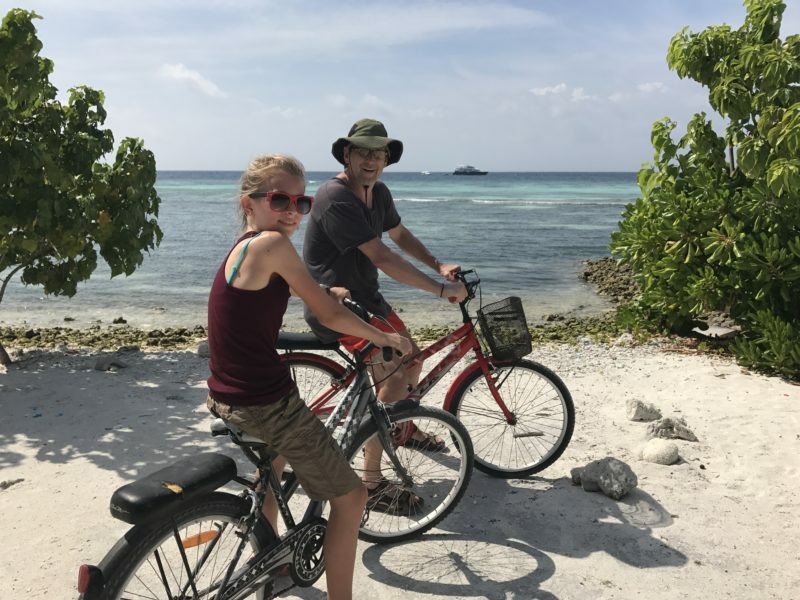 Staying on an inhabited island (Maafushi), was a good choice for our family. Inhabited islands offer value over a resort islands though there are trade offs like wearing modest clothing and no booze. A resort would run $6,000+ USD a week. For 6k, we had better be able to stuff any complaints and make like its the best week of our life. 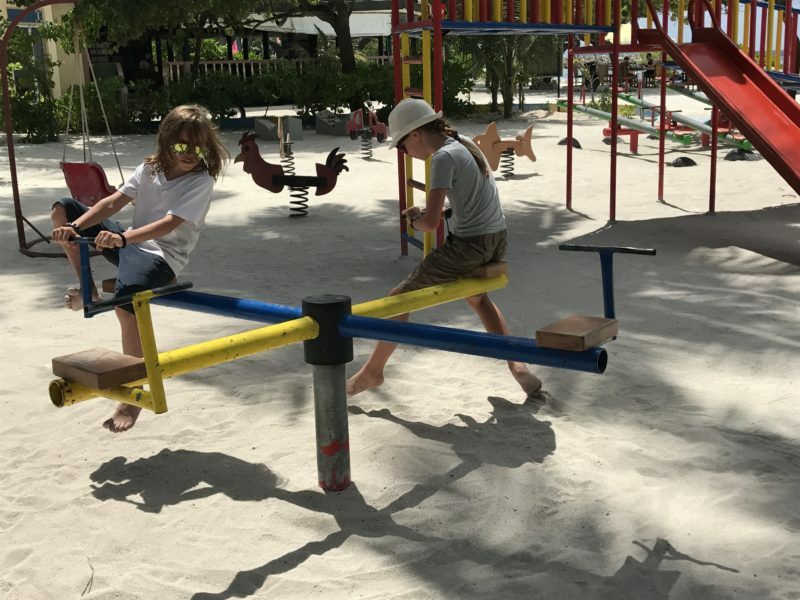 Since kids can’t do that, a resort sounded like a bad investment. We are also sensitive to other travelers including honeymooners who would likely be at the resorts. If we had stayed fewer days in the Maldives we might have stayed on one of the resort islands. And certainly, if you have enough cash to absorb little annoyances without letting it spoil your good time, then sure, book a resort. I recommend a rash guard, wetsuit or even a lycra jacket and running tights for sun protection and warmth in the ocean. I wasn’t cold in the ocean, most likely due to wearing my Uniqlo tech pants (pic of my swim pants below) and tech shirt as swimmers. 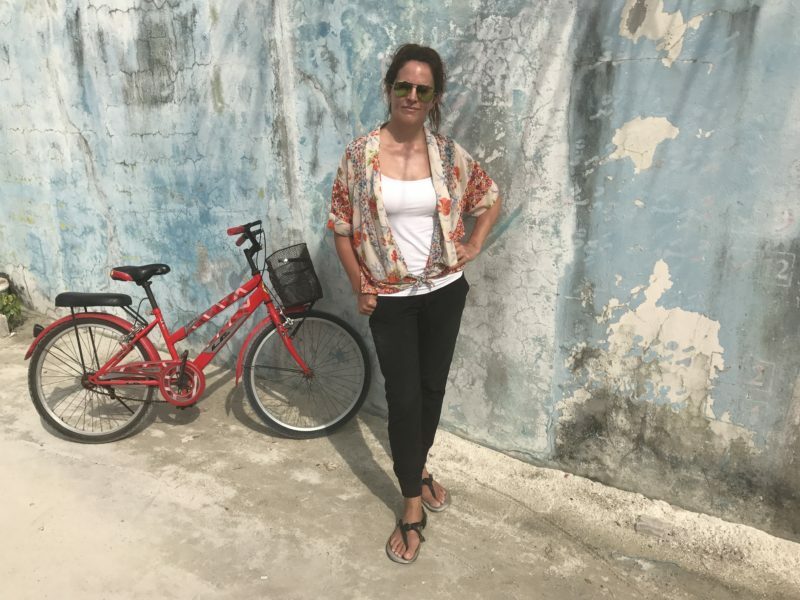 More winning tips – my ‘swim clothes’ nicely doubled as clothing for a month of travel that included Sri Lanka and India as well. Our kids wore typical western swimsuits and a tech shirt and they did get cold in the ocean. I suspect if they had on long pants, they would have been much less affected by the water temperature. 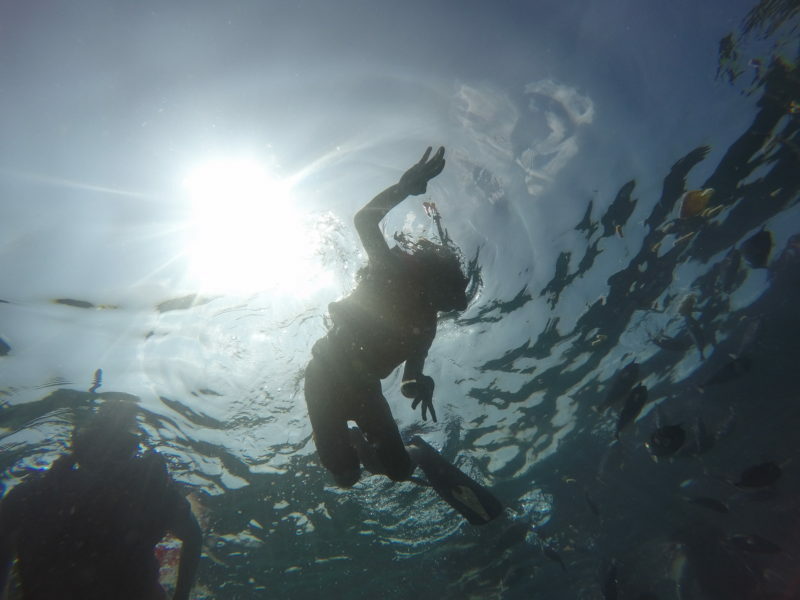 Our son became so cold while snorkeling that I needed to swim back to the boat with him, cutting our snorkel time short. It was disappointing because he was really having a good time snorkeling and his comfort could’ve been easily addressed with the right swimwear. 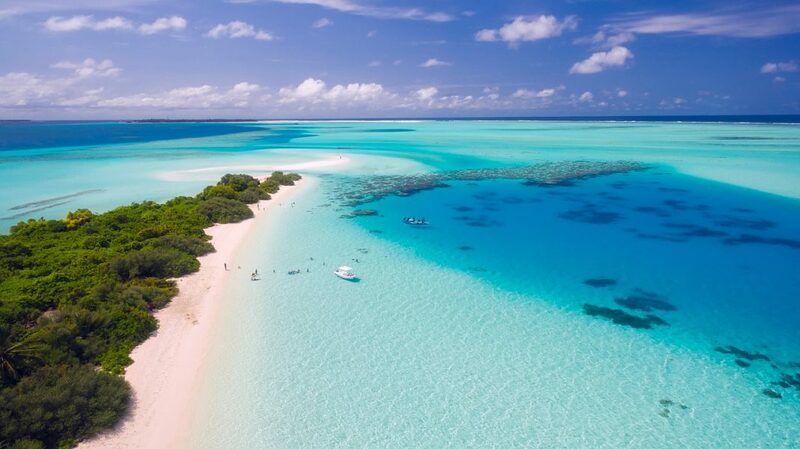 The next time we go snorkeling or diving in the ocean with the kids, even in warmer waters like the Maldives, the kids will wear lycra leggings and a rash guard for warmth and sun protection. As an bonus to covering more of our skin in the Maldives, we received appreciative words and smiles from the locals who practice Islam and tend to dress more conservatively. The island locals have opened up their homes (some literally so) to travelers, so we were happy to be thoughtful of our dress. As a benefit, none of us got sunburns! Maldives is super sunny, so of all of the winning tips I could offer, I recommend wearing lightweight clothes that cover more of your skin. Local men wear longer shorts and a t-shirt or button up shirt to keep the sun off the arms. Local women will cover much more than they expect visitors to cover. As a woman, I liked wearing a light scarf top (see below picture), loose dresses and palazzo pants. Modest dress on inhabited islands is desired, respectful but also beneficial if you want to limit your sun exposure. An umbrella offers sweet relief from the assault of light. The sand, the waters, and the sun are so bright in the Maldives. My eyes were constantly in search of dark bar, of which there are none. And don’t think that glasses will save you – they will not. Glasses just barely take the edge off. We were so glad that we took along our UV blocker umbrellas. The islands of Maldives are at sea level, so its just beach. No elevation, just flat land and ocean, which is cool, but #2. There is not much else to do on Maafushi and I suspect in Maldives, beyond water sports. Turns out, our kids didn’t want to spend 6 days doing water sports (see #3). We stayed too long on Maafushi. We had a lovely time, but we were bored by the end of day 4 because of #1. For more insights into Maldives, read our Emotional Gap Analysis compares our US and Europe expectations to the realities of Maldives.